Search Results for "climbing mountain aerial"
AERIAL: Active girl holds her arms raised in victory after climbing a mountain. AERIAL SILHOUETTE: Outline of woman climbing uphill in burnt orange mountains. 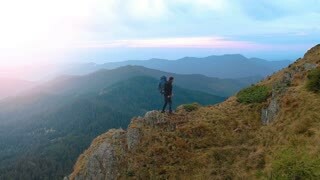 Aerial shot of a man standing on top of a mountain. Young climber happily raises his hands after climbing the mountain. Drone footage of people are climbing mountains in a forest in Ha Long Bay, Cat Ba Island, Vietnam. Aerial: Two hikers climbing mountain. Camera moving from far backwards revealing the hikers. Aerial Climb Up Mountain Bridal Veil Falls Hiker Utah 4K 891. Double cataract waterfall. Summer recreation area for climbing, hiking and splashing in the water. World's steepest aerial tramway was built in 1961, now destroyed. Aerial view of climber solo free climbing on cliffs alone. Man climb the rock without safety harness and ropes. Male climbed the top of mountain and waving hand to camera.